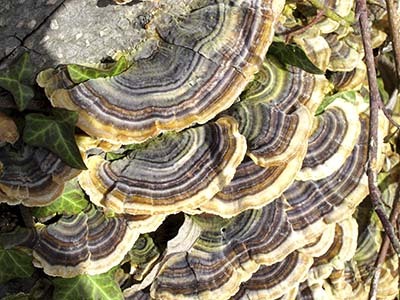 Turkey tail mushroom (Coriolus trametes) has been used in Traditional Chinese medicine for over 2000 years, and has been extensively researched for the powerful immune supporting, antioxidant qualities, most of which are attributed to the amazing polysaccharopeptides it contains. In 2012 researchers at the University of Pennsylvania School of Veterinary Medicine found that Turkey Tail is especially useful toward supporting strong natural immunity in dogs, in very unprecedented ways that could very well revolutionize the treatment of immune compromised animals. To read more, CLICK HERE. Veterinarian’s Apawthecary Turkey Tail Mushroom Supplement for dogs and cats is comprised of 100% certified organic Coriolus trametes, grown in the USA. Except for residual amounts of the certified organic oats the mushrooms are grown on, there are no fillers, preservatives, colorings or flavors added. Just the good stuff! The 200g jar will last most 40 lb dogs for one month. Dosing scoop is included. daily or as directed by your veterinarian. Cats: 1/2 scoop , 1-3 times daily or as directed by your veterinarian.